July 26, 2017, Cayuga County, NY – Are you a curious and adventuresome traveler that wants to discover the unusual, obscure and sometimes just plain strange people, places and events that shape an area's culture and history? 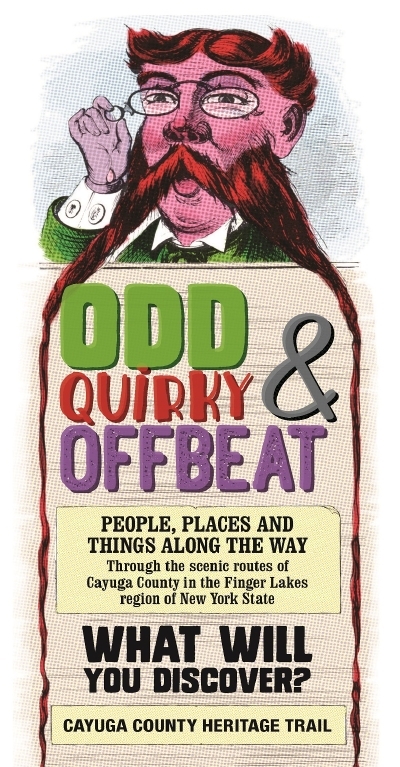 If the answer is “yes" then Cayuga County's new “Odd, Quirky & Offbeat" brochure is the perfect guide to help you discover our amazing (and sometimes odd!) history. Cayuga County Tourism's new “Odd, Quirky & Offbeat" brochure features fifteen historic attractions that have interesting stories tell – sometimes strange but always true. As you travel along this historic and quirky heritage trail that runs from Sterling in the north to King Ferry in the south you will learn the offbeat history of the County while enjoying the scenic routes that wind their way through our rural towns and villages. In northern Cayuga County, visitors can stop into the Sterling Little Red School House and Heritage Park and get a bird's eye view of the Park from the railroad signal tower that is situated so close to the railroad tracks that it has been known to shake in rhythm with passing trains. Moving to central Cayuga County, the Cayuga Museum of History & Art features an “electrifying" display including a photo of the world's first electric chair that was used for death by electrocution at Auburn Prison in 1890. Gruesome but true! The nearby Ward O'Hara Agricultural and Country Living Museum displays a 2,000- pound bell that once hung in the E.D. Clapp Manufacturing plant known for manufacturing carriages and wagons and the invention of the “Fifth Wheel." These are only a sampling of the weird and wonderful attractions you will find along this offbeat heritage trail that welcomes solo travelers, families, children, couples, small groups and anyone who is looking to experience Cayuga County's amazing history from unique angles that shaped our culture and history.